While we were visiting Samarai in the Milne Bay District (PNG) a couple of months ago we saw the memorial which appears on Tropical Territory today. Apparently there was quite a lot of conflict over it when it was erected, and couldn’t be placed anywhere else so it was eventually placed on Samarai even though there was no specific connection. Mr Cassmob remembers his father saying the miners (why??) wanted to have the comment “killed by the missionaries” on the memorial and that the Robinson issue was about the killing of some “natives”. Now plainly this was all quite intriguing so I turned to my good friend Trove to see what it could tell me about the background event. In 1901 Australia became an independent federation and nation. In 1905, it became the Territory of Papua. Australia’s federal election in December 1903. The events we’re looking at straddle this time frame and affect how they was seen. 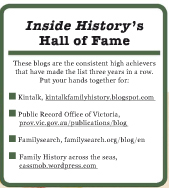 http://trove.nla.gov.au/ndp/del/page/918589. The Advertiser 19 March 1903. 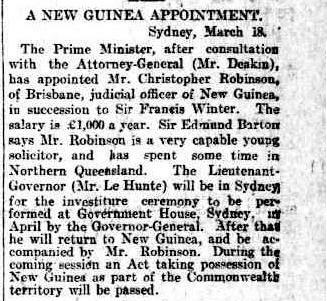 Early in 1904 Christopher Robinson, a Brisbane solicitor, was appointed acting Administrator and Judicial Officer of British New Guinea, pending the implementation of legislation formalising the Territory of Papua under Australian control. 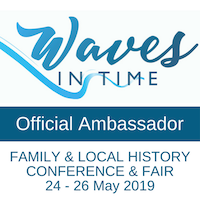 Soon afterwards Robinson set sail on the ship the Merrie England, to the Gulf Province (west of Port Moresby) where two missionaries, Rev James Chalmers and Rev OF Tomkins, had been massacred on Goaribari Island (now in the Gulf Province, PNG) in 1901. On the face of it this was not unreasonable, but in the event, the local people approached the ship, firing arrows from their canoes, apparently in retaliation for the arrest of some of the men believed to have taken part in the killing of the missionaries. Shots were fired from the ship and an undefined number of “natives” were killed. This “Goaribari incident”, as it was euphemistically called, occurred in March 1904. While one could hardly expect the ship’s crew to ignore being fired at, it appears that the response was ill-considered and due to panic. 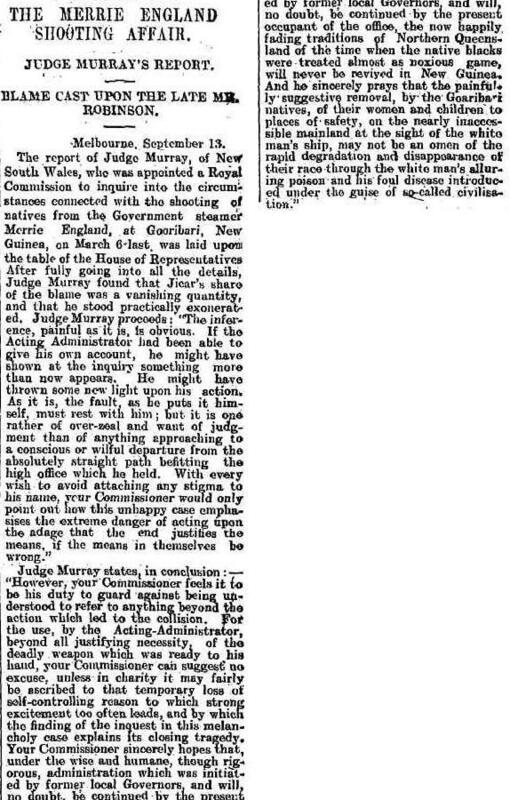 Robinson’s reputation was under a very dark cloud as a Royal Commission of Enquiry was instigated, of which Judge Murray (presumably Sir Hubert Murray) was in charge. Shortly before the enquiry commenced, Christopher Robinson put a gun to his head and killed himself, leaving behind a note which was not released (according to the papers). It is through the reports of the enquiry that we learn that at least eight men were killed, three possibly by Robinson. Perhaps the simple fact is that, with no prior experience of New Guinea, or of the risks associated with working there, he simply panicked and imagined himself massacred as had been the missionaries in 1901. This in no way excuses what happened, whether by him or by others, but he was also human, and perhaps in fear of his life after the decision to capture some of the locals who may/may not have been part of the original massacre. 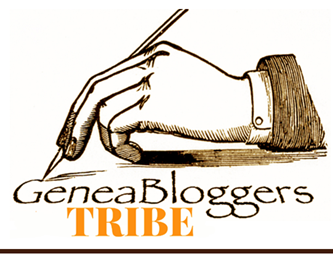 When we lived in Papua in the 1970s, 70 years later, there were patrol officers who had encountered tribes meeting their first white men, and where cannibalism still occasionally occurred. From the local side they felt betrayed by what had initially seemed like a positive interaction with the Europeans. In short, a major conflict of culture and loss of judgement, with consequent loss of life. Discussions around the event were very much focused on Australia’s image, and the need to see it as not condoning the hapless killing of the very people under its protection. Christopher Robinson’s body was returned to Australia on board a boat accompanied by a missionary Mr Jekyll, who had been present at the killings, a coincidence which seems quite ironic to me. The mystery of why the “miners” blamed the missionaries remains unknown, as does the question of why the memorial to Christopher Robinson is on Samarai Island many miles from where the “Goaribari incident” occurred, but, also ironically, not far from Killerton Island where missionaries had been cannibalised. It’s also ironic that it remains on an island which is now entirely settled by local Milne Bay people yet they tolerate its presence. The full story behind this event would merit further investigation as well. The Register (Adelaide, SA ), 24 June 1904. 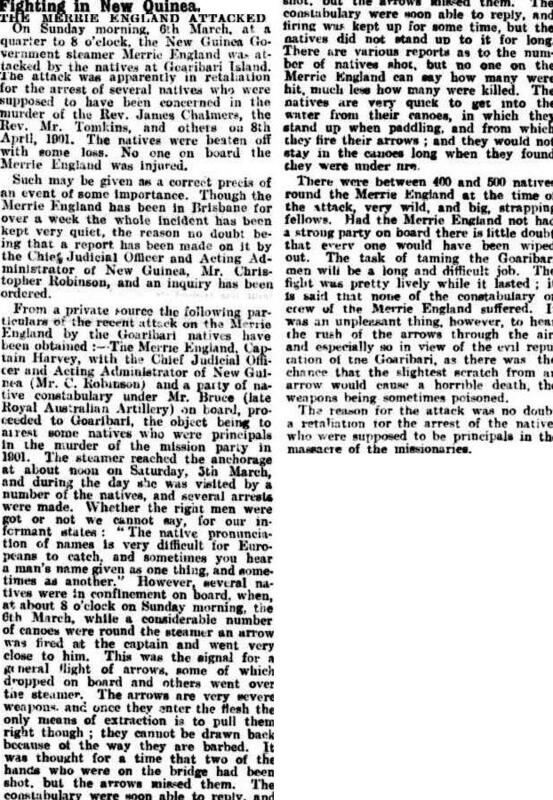 The Register (Adelaide, SA) 14 September 1904 “The Merrie England began it”.